The "macroblog" by the Atlanta Fed is promoting the concept of Money as Communication. Let's take a look. A textbook description of money is usually just a recitation of its functions—it acts as a store of value, a medium of exchange, and a unit of account. This definition of money is a rather hollow one (as Minneapolis Fed President Narayana Kocherlakota noted back in his academic days) because it tells us only what money does but doesn't speak to the core issue—what is the problem that money solves? The "unit of account" function, in particular, gets little development in the textbooks and has generally not carried much weight in the academic literature on the theory of money. (There are a few exceptions, like this NBER working paper by Matthias Doepke and Martin Schneider.) [Mish note: The paper costs $5]. But if people are going to communicate with one another about value, those communications are going to be most effective if done using some standardized metric—and that's where money comes in. As a "unit of account," our money is how we communicate about value. It can be a physical thing, like a particular commodity, or it can be an abstract concept, like the broad purchasing power of a medium of exchange. In other words, it's essential that the unit of account conveys value so that the units expressed in trade, contracts, and financial accounts are both meaningful and durable. We recently produced a simple four-minute video on the subject. Give it a view and let us know what you think. We're big on getting our communications right. By Mike Bryan, vice president and senior economist in the Atlanta Fed's research department. Right at the one minute mark, the video proclaims "In the United States, the standard measurement for value is the dollar." At that point I broke out laughing. But it gets even worse. The massive propaganda campaign begins at the 2:15 mark: "Was the gold standard a good way to measure value? As it turns out, not really". 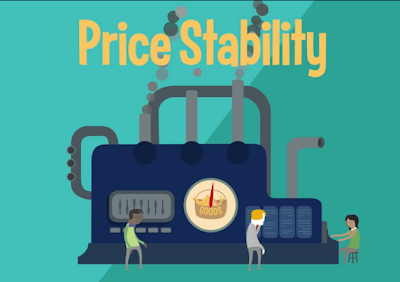 At the 3:24 mark comes pure silliness regarding "price stability". The video proclaims "The Fed is in charge of keeping the purchasing power of the dollar stable." In the interest of fairness and accurate reporting, Mike Bryan ought to have shown theory vs. reality. In particular, Bryan ought to have mentioned the housing bubble and collapse, bank bailouts, the dotcom bubble, and the current Fed-sponsored equity and bond market bubbles. But if he did that, he would have been fired. So instead he writes a bunch of nonsense to make Bernanke and the Fed look good. This is the way the system works, and it explains much of the self-congratulatory hype we see today from academia. Want a job in the research department at the Fed? Well the first prerequisite is you have to be a monetarist fool who agrees with the Fed's inflationist stance. That's one hell of a lot of things to be wrong about, especially for someone "big on getting our communications right". There is one more possibility: Bryan does understand some of those things, but instead creates nonsensical videos to keep his job or get bonuses. It's a tough call, but all in all, I strongly suspect he was hired for his role precisely because he is a brainwashed believer in academic nonsense. Let's step back for a second and ask a very basic question. Please consider a few re-ordered sentences starting at the bottom of page 15 of Murray Rothbard's classic text What Has Government Done to Our Money? Money is a commodity used as a medium of exchange. Like all commodities, it has an existing stock, it faces demands by people to buy and hold it. Like all commodities, its “price” in terms of other goods is determined by the interaction of its total supply, or stock, and the total demand by people to buy and hold it. People “buy” money by selling their goods and services for it, just as they “sell” money when they buy goods and services. Money is not an abstract unit of account. It is not a useless token only good for exchanging. It is not a “claim on society”. It is not a guarantee of a fixed price level. It is simply a commodity. In a footnote at the bottom of page 17, Rothbard explains "Money does not measure prices or values; it is the common denominator for their expression. In short, prices are expressed in money; they are not measured by it." Indeed! And that sentence alone says how ridiculous the video is. Continuing from the book on page 25. Now we may ask: what is the supply of money in society and how is that supply used? In particular, we may raise the perennial question, how much money “do we need”? Must the money supply be regulated by some sort of “criterion,” or can it be left alone to the free market? All sorts of criteria have been put forward: that money should move in accordance with population, with the “volume of trade,” with the “amounts of goods produced,” so as to keep the “price level” constant, etc. Few indeed have suggested leaving the decision to the market. But money differs from other commodities in one essential fact. And grasping this difference furnishes a key to understanding monetary matters. When the supply of any other good increases, this increase confers a social benefit; it is a matter for general rejoicing. More consumer goods mean a higher standard of living for the public; more capital goods mean sustained and increased living standards in the future. [Yet] an increase in money supply, unlike other goods, [does not] confer a social benefit. The public at large is not made richer. Whereas new consumer or capital goods add to standards of living, new money only raises prices—i.e., dilutes its own purchasing power. The reason for this puzzle is that money is only useful for its exchange value. [Thus] we come to the startling truth that it doesn’t matter what the supply of money is. Any supply will do as well as any other supply. The free market will simply adjust by changing the purchasing power, or effectiveness of the gold-unit [monetary-unit]. Bryan, as well as Paul Krugman and all Keynesian and Monetarist economists desperately need to read and understand the book. Please read the eBook! It's a great read, only112 pages, explained well, and easy to follow even for a relative economic beginner. Let's explore the concept of price stability in regards to housing. The article starts with a look at the rate of increase in home prices as measured by HPI (Home Price Index) vs. the rate of increases in OER (Owner's Equivalent Rent). From 1994 until 1999 there was little difference in the rate of change of rent vs. housing prices. That changed in 2000 with the dot.com crash and accelerated when Greenspan started cutting rates. The bubble is clearly visible but neither the Greenspan nor the Bernanke Fed spotted it. 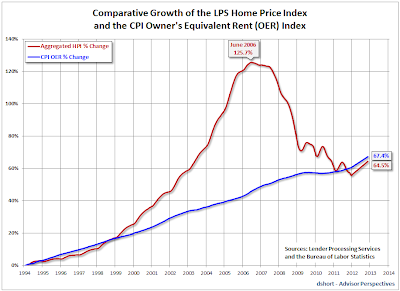 The Fed was more concerned with rents as a measure of inflation rather than speculative housing prices. That look like stability to you? It's pretty easy to ignore price instability, when your job depends on it! How well did the Fed do at setting interest rates? Another chart from the same post explains nicely. 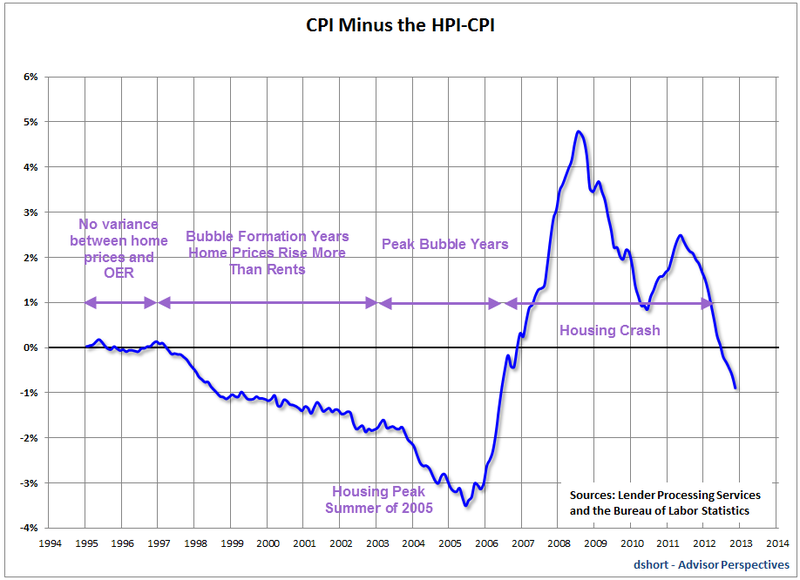 The above chart shows the difference between the CPI and HPI-CPI. Note that the largest negative discrepancy marked the exact top of the housing market in summer of 2005. The Fed purposely held interest rates too low, too long, fostering an enormous housing bubble. Did the Fed ever admit that? Of course not! And Bryan would be fired if he did. In the video, Bryan complained about price stability under gold. 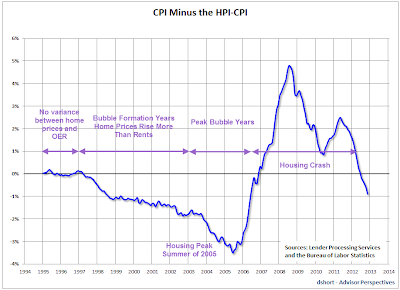 Let's take a look at actual price stability with a chart from Monetary Tectonics. Hmmm. It seems we have had price stability on a gold standard but have had anything but price stability since. Well, when your job depends on it, you ignore such things. Does Bryan understand exponential math? Does anyone at the Fed? I rather doubt it. If they do, they certainly are light-years away in comprehension as to what it really means. 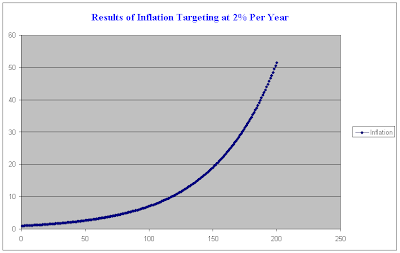 For example, Bernanke is a huge proponent of 2% inflation targeting. Know what that looks like? I do, because I have posted the chart before. Some Keynesian and Monetarist nutcases propose 4% inflation targeting. What if wages don't keep up? As you can see, real disposable income per capita is not an exponential function, but rather a linear one. 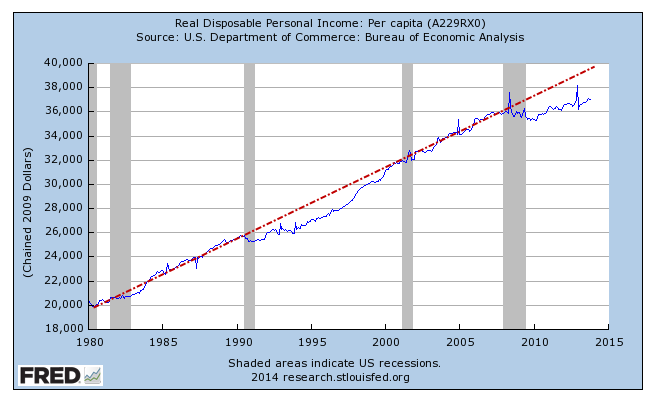 And even on linear basis, income did not keep up. And how does the Fed respond? The result is more asset bubbles that the Fed still cannot see. Interest rates are so suppressed that it is convenient for companies to buy hardware and software robots instead of hiring workers to do jobs. Robots don't complain about working conditions or pay, but Fed consultants never noticed. Nor do Fed consultants investigate why the Fed's inflation policy is not working as expected. Then again, their job depends on not noticing and not investigating. Bryan says "Give it a view and let us know what you think. We're big on getting our communications right." OK Let's rate the video. In conclusion, Mike Bryan did his job to perfection. Congratulations! Mike, please tell your boss you deserve a raise. Today is the last day for a Wine Country Conference II discount registration. The second annual Wine Country Conference will be held May 1st & 2nd, 2014. Some of us in the industry who have done well are making an effort to give something back. John Hussman is at the very top of that list. We extended our $200 "early bird" discount through January 10, for those who register early. There will be no further extensions. Please Register Now!